This is turning into quite a scene. But finding the culprit will have to wait. The biggest priority is making new sweets. The 3 of them agrees it’s unacceptable they lack snacks for their 3pm snack time, and decide to go look for ingredients. Laala and Yui are getting more impatient by the minute. And hungry. But this is when Mia appeared, shouting: “Waaaaaaii! Mia’s the beeeest at anything! Including finding ingredients!!”. Mia’s running towards them, her hands full of nuts and fruits. Small, cute friends are running alongside her. “And they gave me some of their ingredients to make snacks!” Mia kept boasting. “Usually one would feed animals, not get fed by them…”sighs Laala and Yui. But now they got their ingredients, and can finally make sweets! Everyone is getting hyped, and ask Aira to Pretty Remake some Rascal All Friends coords! Naru and the mascots are back as well, so the atmosphere is truly happy lucky! The All Friends, the rascals and the mascots all had fun eating delicious sweets! Thus another day passed by, and they yume kashikomaly managed the gather the beeeeest sparkle! 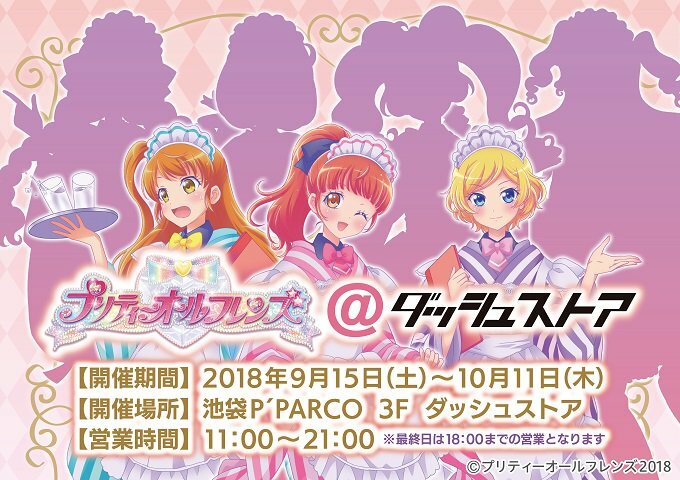 This story was released on July 27th 2018, and is linked with the PAF x Prichan x Puchi Rascal collab announced simultaneaously. 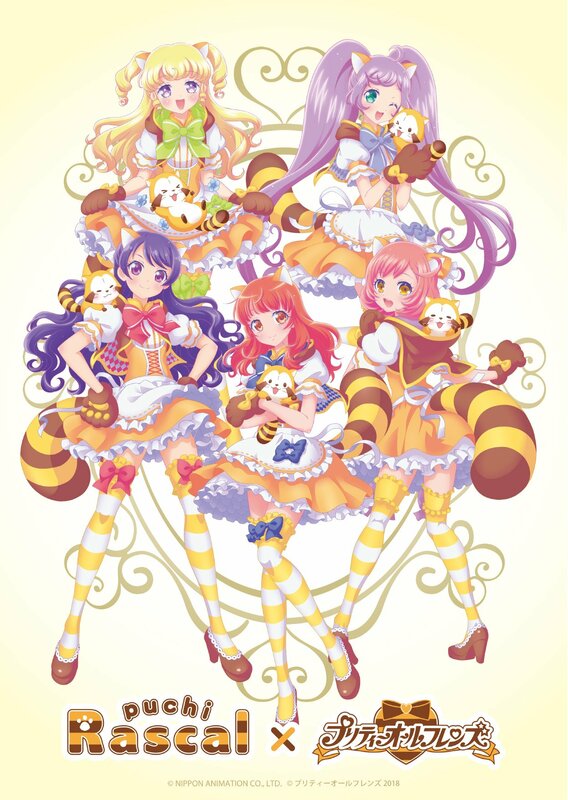 All of their Rascal All Friends coord are the same, except for the color of the ribbons and the color of the checkering on the backside of the cape. Mia’s must be red because most of her main coords (the first one as Prizmmy, the one as Cosmos, and the Jounetsu coord) are primarily red. But I don’t know if there’s significance in the others’ colors. Also I wish they drew Mion and Rizumu wearing them too. They’re still in the forest from episode 3 & this takes places at the same time. Maybe the things there are different from mushrooms, nuts etc normally found? It’s unclear whether they’re confused on what to pick because of that, or simply because they lack botany skills. Probably the later, even if the PAF version of the girls are supposed to be older. It’s unclear what Aira Mion and Rizumu were doing during the timeframe before the party. At least they didn’t go with Mia Laala & Yui to find ingredients. Maybe they stayed on the magic bus. I quickly gave up trying to find a better translation for the final sentence which was “今日もキラキラがいっちばーんユメ集まったのかしこま!”. I’d probably find something good if I spent 20-30minutes on it. While I like Naisho’s Capisce and sometimes use it, I never thought about how to translate Mia ga ichibaan or Yui’s yumeyume something especially when they aren’t isolated. Seeing they actually wrote a story for the Puchi collab, next episode will probably be a story on the PAF Dash Store Japanese Tea Shop themed goods collab. I hope they remember to rewrite the story so it doesn’t say they’re wearing “taisho roman” outfits, to avoid more controversy.